Washington, D.C.—Wayne LaPierre, Executive Vice President of the National Rifle Association lashed out at critics of the NRA’s lobbying efforts to protect private ownership of drones and drone missiles. Mr. LaPierre was speaking before a small gathering of armament manufacturing CEO’s here in the nation’s capital. They had come to lobby their Republican congressmen and senators to resist attempts by bleeding heart liberals to curb sales of any weaponry that could potentially be manufactured in the U.S.A. The question of school safety, still on everyone’s mind in the aftermath of the Newtown school shootings, came up quickly in a question from the audience. “Excellent question!” Mr. LaPierre replied, spinning on his feet and pulling out his gun finger to shoot at the inquiring CEO. “Thought you had me there!” he joked, blowing off the imaginary smoke from his recently fired gun finger. 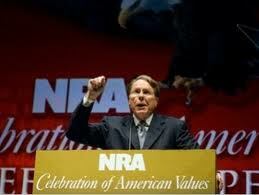 Mr. LaPierre turned to face the blank screen behind him, raised a remote control and clicked it at the screen. This entry was posted in politics and tagged Gun Control, NRA, Republicans on March 11, 2013 by Paul Steven Stone.